Hyderabad is the state capital of Andhra Pradesh. Hyderabad is an important hub of IT and ITES companies in India. Hyderabad twinned with Secunderabad city is the fifth largest city in India. The main attractions in this software city are Charminar, Golconda Fort , Chowmahalla Palace, Falaknuma Palace, Birla Mandir, Birla Planetarium, Hussain Sagar Lake and Ramoji Film City. Charminar is the major landmark of Hyderabad city. Charminar was built in 1591 and encloses a Masjid in the first floor which can accomodate a lot of people. Charminar gets its name from the four minates that it has. 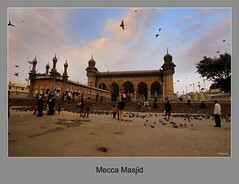 Near by the Charminar is the Mecca Masjid, a Masjid built out of stone which was completed in 1617. The Golconda Fort lies at the outskirts of the Hyderabad city. The Fort is a massive structure with wall encircling it of 7km in length. The Golconda Fort have splendid acoustic characteristics, a clap at the portico can be heard at the top of the citadel. Chowmahalla Palace was built by the Nizams and Falaknuma Palace was built in Italian marble by an Italian architect. Birla Mandir is a temple made of white marble dedicated to Hindu deity Lord Venkateshwara. Birla Planetarium displays the advances in science and technology and has structure resembling the Gol Gumbaz at Bijapur. Hyderabad city has a lot of lakes both man-made and natural. Hussain Sagar lake is one of the man-made lake separating the twin cities of Hyderabad and Secunderabad. The lake has a monolithic statue of Gautama Bhuddha erected in 1992. Ramoji Film City is an integrated film studio covering an area of 8km*km. Apart from these other tourist destinations include Snow World, NTR gardens, Nehru Zoological garden etc. Best time to visit Hyderabad is during September to February. Being a state capital and an IT hub, Hyderabad has hotels suiting all budgets. Hyderabad is 530km from Bangalore. Route 1: Bangalore - Chickaballapur - Bagepally - Penukonda - Anantapur - Gooty - Kurnool - Kothakota - Badepally - Shadnagar - Hyderabad. APSRTC , KSRTC and Indian Railways runs direct services Bangalore to Hyderabad. A couple of airways run direct Bangalore - Hyderabad flights. To get around in the city APSRTC buses and private cabs are available.